There is no special saving feature in Black & White multiplayer. But that does not mean that saving there is impossible. Multiplayer match is automatically saved, when game becomes not synchronized. That can be achieved with different methods. Here I want to explain the easiest one. Sadly, it can be used only in Creature Isle expansion, but still is pretty useful. First thing, that you need to do, is to make sure, that at least one of the players uses the Football Add-On, and at least one other player does not. This add-on is already part of Creature Isle, no need to specifically install it. 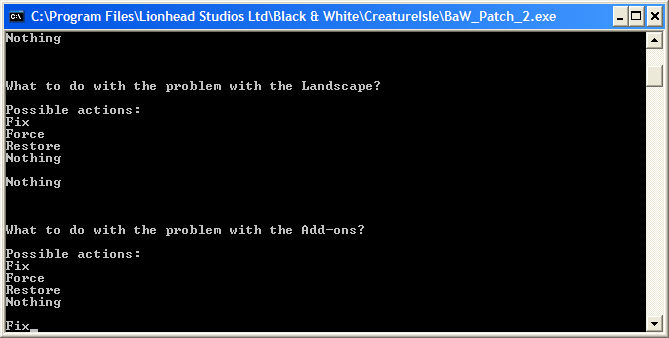 To activate or deactivate the add-ons, you can use BaW Patch 2.0, like it is shown on the picture below. "Fix" for activation, "Force" for deactivation. With this add-on enabled, it is possible to make football fields in the game, by using a level 8 scaffold. If at least one player at the time of scaffold creation does not have this add-on enabled, the game will lose synchronization and become saved. When game is out of sync, files oos.txt and oos.lnd are created in the game folder, which can be (together with oos.dat) later used to continue the game. You can put those three files in a special folder, for example, to store the save. To load, all players should just put the files back into theirs game folders, launch the game and join the hosting player, who would host while using "Resume the last online game". It is not important, if the players are the same - any group of players can load the game, if they have the needed files. They can also choose different colors. Such variables like prayer power, unfinished buildings, location of creatures and so on is not saved. But other things are. There is a useful way to modify maps, using multiplayer games and their saves. You can transform the save files into skirmish and multiplayer maps. To transform into a skirmish map, you need to rename oos.txt and oos.lnd and modify the LOAD_LANDSCAPE line in the .txt file. Of course, these skirmish maps may be converted into multiplayer maps like any other skirmish maps. This way players can modify and set up maps, by simply playing and placing needed objects in game. In some way it is like collaborative art, where multiple players can work together on one project. Of course one of the players may do nothing and leave the other one to do all the work (2 connected players are the required minimum for this method to work).